This study was intended to analyze the metabolic pathway of Rumex obtusifolius L. (Broad-leaved dock), destructive weeds worldwide, in relation to major environmental factors (light and temperature). It was found that R. obtusifolius can be classified as plants in accumulating major organic acids such as oxalate in leaves and citrate in stems (Miyagi et al., Metabolomics 6:146–155 2010). 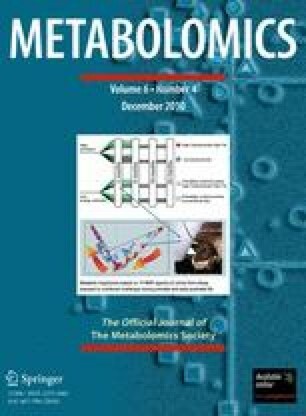 The organ specific accumulation of certain metabolites was dissected by metabolomics approach in relation to metabolic pathway. Light or dark experiments showed that in the case of the oxalate accumulation, the major or the most dominated pathway was found to be the citrate-isocitrate-oxalate shunt. Furthermore, under the dark and/or low temperature (5°C) leaves showed sustainable growth with normal accumulation of TCA metabolites. Unlike leaves, there was a different pattern of metabolite accumulation in stems. Other metabolites such as amino acids also showed the organ specific alterations under the different ambient environments. The online version of this article (doi: 10.1007/s11306-010-0220-0) contains supplementary material, which is available to authorized users. This research was supported by a grant from the Program for Promotion of Basic and Applied Researches for Innovations in Bio-oriented Industry (BRAIN) and the CREST, JST, Japan.